When you picture a frog, you probably envision a long tongue catching insects for a yummy dinner, nothing at all like what you see when you open your own mouth wide. The positioning of frogs' tongues within their mouths is totally different than that of humans. Human tongues are attached to the backs of our mouths, while frogs' tongues are connected right where their mouths start. This is not without a useful purpose. Frogs' tongues are designed to jut out and retrieve sustenance, a process that is occasionally called a "lingual flip." Frogs don't only differ from people in how their tongues are attached; their tongues are different from most creatures. When frogs' mouths are ajar, their tongues are driven forward by muscle contractions. This action rapidly tugs frogs' mouths down, which then directs the rear portion of the tongues outward. The pressure produced by the weight of the tongues leads them to stretch to roughly twice as long as when they're at rest. When hungry frogs' tongues finally make contact with their desired prey, their muscles contract yet again. This contraction pushes the tongues back in swiftly -- the entire process can take less than a second, moving much faster than a human tongue can. Frogs' tongues feel gooey, which is how they're able to successfully seize and maintain their food findings. The gooey stuff is nothing elaborate -- just sticky frog saliva. Unlike many other animals, frogs are somewhat passive in their approach to hunting for food. The amphibians don't usually chase their prey, but instead patiently wait for victims to show up. The frog world consists of a massive selection of species, although the majority of them regularly consume staples such as insects, slugs, worms and spiders. Bigger species often focus on slightly bigger prey animals, including birds, tiny reptiles and rodents. They sometimes even chow down on fellow amphibians. Frogs' mouths consist of small teeth that, just like their tongues, are useful for grasping prey. Their don't employ their teeth for chewing, but rather for keeping their meals secure. 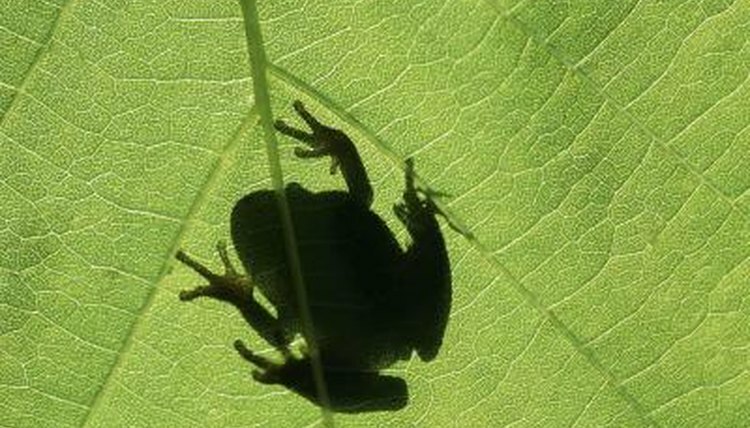 Frogs swallow their meals intact -- no chewing necessary. Strangely enough, their eyes assist them in getting their meals down. If you notice a frog's eyes dropping slightly, it means he's in the midst of swallowing.